The Kendall Plan is a 2-story home + 3rd story loft/bonus room with 4 bedrooms, 4 baths, flex room, bonus room and great room for a total of 3,464 square feet of living space. The main floor features a spacious great room open to kitchen and large dining space, flex room/5th bedroom and 3/4 bath. Enjoy an open kitchen featuring stainless steel appliances, solid surface countertops, full tile backsplash, walk-in pantry and large island. 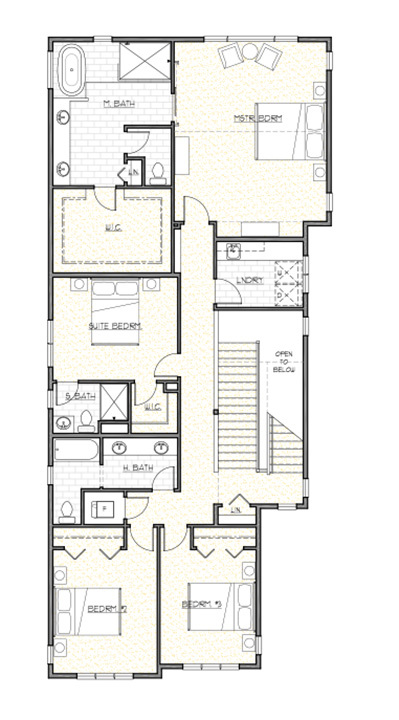 Second floor features 4 large bedrooms and 3 bathrooms. Master bedroom offers vaulted ceilings, master bath with freestanding soaking tub, separate shower and large walk-in closet. Third story features a spacious loft/bonus room.